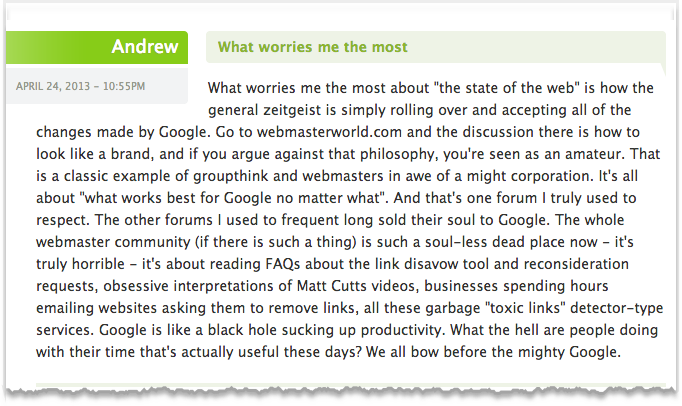 The above comment is from Aaron Wall's excellent SEOBook.com -- my go-to source for understanding search engine optimization and the algorithmic games that Google [$GOOG] plays with hundreds of thousands of businesses the world over. Few journalists understand Google's business because if they did they would be writing some amazing stories, stories that would attract scrutiny of the kind that Google wouldn't want. Journalists run their Google beat as if it were based in Detroit, not Silicon Valley, because they don't understand the dynamics of its business but they can understand a driverless car. They don't see that Google is engaged in a massive war against small business, which is fundamentally a war against jobs. Google's dirty little secret is that its commercial algorithm is broken and it can't distinguish between quality content and spam. Which is why it is backing big brands in a big way because that's the easiest way to sort things out. That's too bad for small mom and pop businesses and the backbone of the economy.